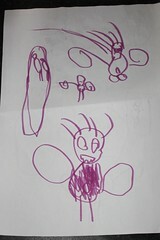 I found these drawings that my youngest son did today while clearing out some paper work. On one of the pic's I have his name and date so I have covered that area at the top for now. These were done on 14-11-16 and he would have been 6 years old at the time. The history is I had been visited by 3 alien types between appox 3 years to 16 years, I am now over 50 years old. My eldest son that lives with me has never reported anything like this that I can remember but our youngest son started reporting being visited at a very early age. I can't remember when it first started for him exactly but it could well have been a couple of years before he did these drawings. He has always been too terrified to talk about these visitations at length although I do remember him saying very early on so approx age 4 telling me he was not allowed to talk about his experiences because the alien vistor (one or more I don't know) told him he was not to tell us and if he did tell us we (his parents / brother?) would get hurt. That always stuck with me as an unusual thing for him to say at the stage of life he was at. Unusual in the sense that it had come from outside his current level of understanding at least in my opinion anyway. So I want to share these reports and drawings of his experiences with you. I am not to say they can't be dreams but after all that has happened I believe (and I like to think of myself in general as a skeptic) that this is an actual alien contact. I put up CCTV over the bedrooms and outside the house that records 24/7. I have not located anything of interest on the DVR yet but I would hazzard a guess that our basic technology would be no match for them anyway. My son has been so terrified that he has slept beside his Mum for as long as I can remember. My wife has had a sighting for several minutes as it observed her and my son in bed. It was after this that I quickly bought a DVR and put the camera's up as she was freaked out badly as you can imagine. I need to spend more time looking at my son's drawings as well. We don't talk about this in front of him as it unsettles him. Edited by rainmaker, 25 July 2018 - 11:12 AM. Vern, try to upload the pictures onto a host site like Flickr (this is the one I use). This is how you can copy and paste the picture into the forum. go to the submenu on the left-hand-side. run the mouse over "You"
scroll down to "Camera Roll"
you will be able to paste the picture into the forum. It sounds like your son is comfortable drawing and I feel it is a way for him to express what is happening to him without actually voicing it. "If you tell someone, something bad will happen to them." They love to use that one. It's more about the psychological torment this idea causes the child than it is about attempting to keep things hush hush. Intruders who use these sorts tactics are scum. Period. I also believe it also enforces the children's own beliefs. I understand, children often don't speak about nightmares or terrible things that have happened because if they do, it might make it happen or become true. I suppose being told not to talk about something would only reinforce this belief to them. Here is what my wife typed about her sighting / experience, I thought it best come from her in her own words for obvious reasons. In the middle of the night I was woken by the feeling of something watching me and my son who was sleeping beside me. I sat up immediately and looked towards the window, this is when i saw a very large form almost like a very big man standing at the side of the bed next to my son. The form had spirals of colors swirling around the whole time. The only way i can describe this is like when you see petrol in water and the awesome colors swirling around. I didn't feel threatened but I was aware that i was being closely watched, i turned to switch on my bedside lamp and turned back and the form was gone, i must have been watching it for 5-6 minutes beforehand. ok so my first question to my wife that night and again today was ''why didn't you call me right away'' I was only in the next room. She said she didn't feel threatened and felt mesmerized by the swirling colors. I can rule it out being a person right away, I have made our home like a mini Fort Knox and there are multiple alarm systems in place running on different signals / systems that only we know about (self installed) I would agree that it sounds like over kill but I sleep better at night knowing that if we have an attempted break in we will get some warning. Prevention is better than being a victim. Edited by rainmaker, 26 July 2018 - 02:27 AM. I feel the best thing, for now, is to do what you are doing. 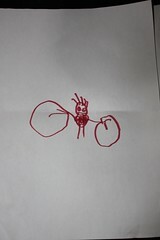 Encourage you son to speak about his drawings if at all possible and document anything out of the ordinary. You will be surprised how much we misremember sometimes. I must admit I haven't dealt with this sort of visitation. I feel your wife has good instincts and maybe in some way that was what was being portrayed by your visitor. ... Prevention is better than being a victim. I agree. Don't be a victim in your own home. Don't allow unwanted visitors who terrify your child to continue to do so. While you may be feeling a little lost as to what to do, I can assure you that just being the father (and I assume also the owner of the residence) places you in an excellent position to help your son. The best position really. I should mention though, helping your son will likely involve taking care of some 'unfinished business' of your own (with your own visitors). What do you think maybe the unfinished business between me and them? I would put my mind and body on the line for my family like any good Dad. My concern is that even if I was able to intervene and deter his visitors would they leave him alone or just take him? In my experience when I got a bit older and more difficult to control I was under some form of sedation but in the end I was able to fight them off. It could well be that they let me think I could fight them off. I don't know but at that point it appeared they had got what they wanted from me and to my knowledge never bothered me again. But yeah if I can help him without making things worse for him then I'm all ears on what I can do. One thing I forgot to mention was how our oldest cat is so protective over the boy's at night. At 14 years old he is an old boy for a cat but still runs around the garden like a kitten / greyhound scratching his favorite wooden pole, checking to see we are looking then takes off around the garden playing. Anyway he and the whole family are very close and it may not mean anything but at night he more often than not comes in and lays near the doorway of the boys room when they are in bed asleep like he is keeping guard. My wife has managed to get out of our youngest boys bed and now sleeps in there on a mattress on the floor in between the boys two single beds. 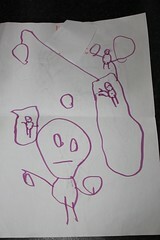 (In one of the drawings my son drew you can see two single beds and him and his brother in bed. I think animals have an amazing sense for things we humans do not seem to have. It is a very frightening topic and as I admitted before I know very little on the subject, but, I have been doing a bit of research/ reading. Here are a few links I found that might be of interest. I am interested in anyone's thoughts; some articles allude to there being 2 different types of contact those who observe and are benevolent and those who abduct, are negative, with dark energies. Vern, I hope you have the observing benevolent type! That will go away! It looks like strong advice for one to feel in control and a great tool to empower. This sort of empowerment seems to be by in large forgotten or over looked by most today. Being spiritual myself and in tune with mind power I'm like cool it could work. I am always a skeptic but with nothing else to try right now it is so very much greatly appreciated that you took the time to find this for us. Edit: Also just read one of the other links by Deborah S K and interested to read that others reported been visited by three visitors like me. I had heard this before years ago but I guess it helps me feel better about my experience each time I hear it. In the sense that it reminds me I am not the only one to experience this. Edited by rainmaker, 27 July 2018 - 09:03 AM. Just to be clear, I've crossed paths with the three main races listed in the 'How to Refuse Alien Abduction' link posted by Klainey and have also crossed paths with those these races work under. I'm familiar with their tactics and how they think - the layers and layers of games they play with people, and so I can easily point out and explain how they are playing the author to setup others. Will I put in the effort? I don't know. It's rarely appreciated. Great. No such risks needed here. Well, there's nothing to 'intervene' with if unwanted visitors lose their ability to visit + no reason to 'deter' someone from doing something they're incapable of doing. Their 'ticket(s)' can be voided / permission can be taken away. The 'end of the tape' might not have been the end. Maybe it was, maybe it wasn't. Either way, visitations in a parent's childhood (and possibly adulthood) often carry on with one or more of their own children, with the same visitors or others. edit: forgot to say hello. Fixed that. Edited by True North, 27 July 2018 - 07:25 PM. Personal integrity does indeed play a part in the 'spiritual' authority you wield, and so plays a part in your ability to dictate what flies and what doesn't fly with your own body ('body' including all your energetic bodies) and your space (your energetic field and the spaces you have authority over such as your property and house). One way to think of integrity is the degree to which "what's coming in" (your physical and mental diet) and "what's going out" (your creations - your thoughts, speech, actions) is inline with your spirit. If that's something you take away from the linked document about how to be in a good position to refuse abduction (or refuse anything you wish to refuse), good. Lying or being dishonest spiritually weakens you. Taking responsibility and being true to yourself spiritually strengthens you. That sort of stuff. Edited by True North, 27 July 2018 - 10:14 PM. I sure would like to talk to you and wondered if this might be possible? I would be happy to pay charges and only call when convenient to you. I am very happy to get further advice on the matter. I am interested to know why *they* would need to respect ones will power but only with spiritual light? how could they even measure spiritual light? obviously they don't respect will power on it's own as they take what they need under protest. I am very happy to get further information on the matter. I am interested to know why some people are saying *they* would need to respect ones free will but only with spiritual light? how could they even measure spiritual light? obviously they don't respect free will on it's own as they take what they need under protest. Also I am a bit skeptical when reading about the Mantis - Grey's and Reptilians that none of them seem to be atheist. So if most of the Grey's are considered bad in human terms as is claimed how can we revoke their ticket to visit as you put it?????? Sorry, that would be the board's safeguards, it only allows members to edit their own posts within a 24 hour period. Email works best for me. I sent you a private message with my contact information. I treat everyone the same, meaning I have the same boundaries with fellow humans as any individual of any other race (dead or alive), and the the behavior I will and won't tolerate is the same across the board; it doesn't matter if you have skin or scales or a carapace, or none of these. I don't have any fear of any other intelligent beings, including the meanies I know who might be called the worst of the worst and aren't included in the races so far mentioned in this thread. If I respect others' spaces and they respect my space, we got no problems, and we each go about our merry ways (or not so merry ways). Where my business and theirs intersects, and our intentions are in alignment, there's no conflict. Where my business and theirs intersects, and our intentions are in opposition, whichever one of us is acting from a position of greater authority will be in the best position to resolve said conflict. The REASON I'm sharing this here is I'd say the biggest questions in this thread are concerned with personal power, and therefore are essentially questions of authority (without which, if you've given your authority away, you have no real power backing your sheer will in the moment). Q: What gives anyone (human or nonhuman), anywhere, authority over themselves or anyone else? Questions along these sorts of lines, when thoroughly wrestled with and explored, can provide insights into hardwired laws of the Universe that, once you understand them, you can put to work for you (by working in accordance with them). Most nonhuman manipulators operating here are taking advantage of people's ignorance of these laws, and so, to those who don't understand these laws, can appear to be completely circumventing others' free will. Understandably, it's frustrating for people who're having unwanted things happen to them (despite their protests) to keep hearing a bunch of talk about 'the power of free will' and how 'free will must be respected'. They say to themselves, "well, mine sure isn't being respected!" Edits: prefaced my post, changed wording in opening paragraph to make it clear I was talking about myself and the others in general (not anyone here specifically), added more questions, added a final paragraph. Edited by True North, 29 July 2018 - 10:24 PM.